Welcome back fellow book addicts. While we may have made a slight detour on our journey of book addiction with the fun yet very enlightening discussion about the Fifty Shades of Grey cast, the time has come to discuss another book from my Never Ending Book Basket. Today we travel back down to the south to discuss Fireworks Over Toccoa by Jeffrey Stepakoff. I know what you’re thinking: Are all the books on here going to be about the south or take place in the south? The answer to that question is no, but be forewarned now, I LOVE the south and many of the books set there. I find it very easy to slip myself into a southern state of mind. (It must be the Marylander in me) So it is very likely that a good number of the books discussed on here will take place in the south, but I promise you that each book will have you wishing you lived there, breathed there, and simply felt there. Now for Fireworks Over Toccoa. This sweet and charming book is set in the small town of Toccoa, Georgia in a time long ago right after the second World War. The story centers around Lily Davis Woodward and Jake Russo as happenstance brings them together despite their past and present lives. Lily is currently married to a man she hasn’t seen in over three years because of the war. Jake is an Italian American war veteran coming to town with a troubled but endearing past, and brings with him the gift of fireworks for the town of Toccoa. What ensues when these two meet is a charming story about what happens when you meet someone who you know is going to change your life forever. The setting of the story. You knew this was coming right? The setting is set up well, and it is very easy to picture Toccoa Georgia in 1945. It is written so eloquently, I swear you can even feel the heat on your skin. Toccoa creates a nice backdrop for the story unfolding in the book, and provides the reader with an unforgettable experience. The background and history of Toccoa is also a nice added feature that fits in seamlessly with the characters of the book. The theme of love. I won’t reveal too much of what happens in this story, but it is obvious that this book is about love, which is something near and dear to my heart. The varying levels and displays of love in this book are heartwarming, and makes for a story that will simply make you feel the love. All over. Lily Davis Woodward. I adore a strong female character. (Is that really hard to understand? I am a female, hello?) Lily is a very unique and vibrant character, and is one that does not fit the exact mold of what you think a young woman would be like in post war America. Simply put, Lily defies the mold, but in a way that makes you love her for her vibrancy, tenacity, and desire to simply feel something out of the ordinary. Hello, it’s a love story. What else can I add to that? This is a love story. Plain and simple. Similar to others out there, but Fireworks Over Toccoa is set apart by how the love story is presented and told. Past, present, and future collide here. It also has an air of mystery to it, because while reading there are many ways the story could go. The story simple isn’t told. You feel it. You breathe it. You are immersed in it. What was left unsaid. I won’t discuss too much about how Lily and Jake’s stories come together, or how they end, but I will say while reading I found myself wanting more for each of the plausible endings that could have happened. This story presents many distinct options for how this book will end, and while I was satisfied with the ending I was left wanting to know more. I know beggars can’t be choosers, and that readers often want more when they come to the end of a book. (Believe me I’ve read a ton of books where that happened) I just felt more information could have been presented about everyone involved in the story, without needing to change the actual plotline. The pace. This is a very fast paced story. I won’t tell you a timeline, but let’s just say it ain’t slow in any way shape or form. I do think the pace was done intentionally this way, and while it keeps you on your toes, I found myself wishing at times things would just slow down. I wanted more time immersed with the characters and the love, and I didn’t feel like I really got that chance. 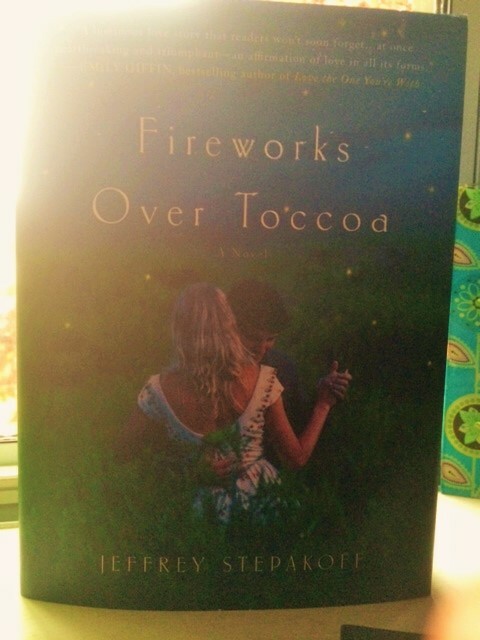 Fireworks Over Toccoa is a lovely story set in a time that many of us never had the chance to see. It does a nice job of presenting a love story set to an amazing southern backdrop. This story will leave you wanting more for many reasons, but simply put, it is a love story. It is easy to dive into, and immerse yourself in for a short while. Reading this book is easy as pie, and it will have you waiting for the day that that certain someone will come into your life and change it in ways you never thought possible. And of course, there will be fireworks. Just added to my books worth reading list!